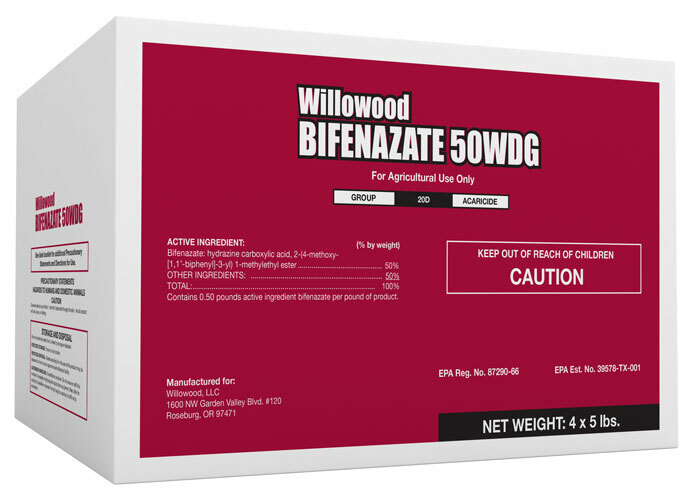 Willowood Bifenazate 50WDG is a versatile, broad-spectrum miticide that provides control of a variety of mite pests on a number of crops including tree nuts, stone fruit, pome fruit, legumes and more. Packaged in convenient 5 lbs. jugs, Willowood Bifenazate 50WDG provides quick knockdown and long residual control while providing safety to predaceous mites and other beneficials. Contains 0.50 pounds active ingredient bifenazate per pound of product. (Go to Agrian.com for current state registration information). ACRAMITE® is a registered trademark of Arysta LifeScience North America, LLC.